The Dressage Foundation is pleased to announce that the Karen Skvarla Fund Grant has been awarded to young professional Heather Hamilton of Raeford, NC. Heather intends to use the $500 grant to ride and train with Lynn Leath and Roz Kinstler. Heather owns and manages her own barn, The Bunk House, LLC, and is an assistant manager in training and instruction at Heather Ridge Farm. 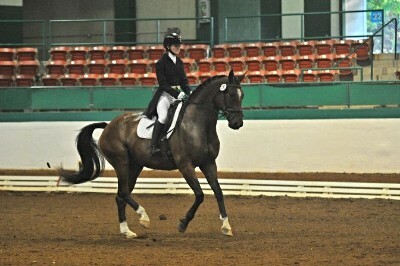 Since 2011, Heather has been involved in professional dressage training and works with many youth and amateur riders. “I am honored to have been selected for this scholarship and look forward to scheduling lessons that will help me develop my horse, as well as my understanding of correct training. I will take these educational opportunities and pay it forward to my students in sharing my new found knowledge and skill,” said Heather.